Looks to me like the closest set of runs are actually below the mean in FI too. 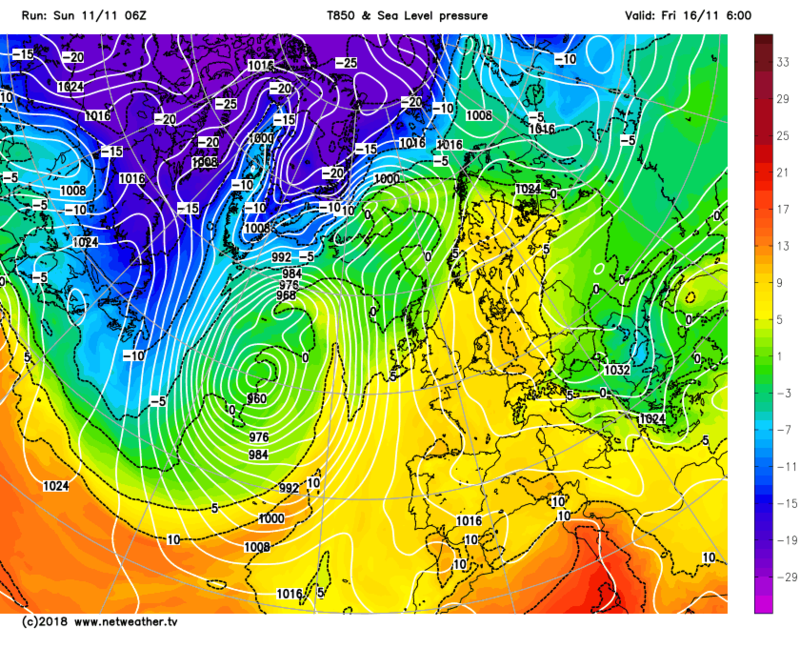 Does look as though D7-10 the high will be stuck a bit but hopefully another shot will see it to Greenland after that. There's been the odd run I've thought hmmmm and arrrrrh. Today's 06z is overall good. I'm not convinced about the low pressure making it milder towards this Sunday like a video forecast I've seen. If that is the case it seems a very brief milder interlude according to this morning's 06z. It's probably me. And I'm sure I'll be corrected if I'm wrong. I'll be on chart watching like a rash. I don't think I can post much more till next week now. As there's such a wonderfully cold outlook on offer, I'm guessing I'm not alone in feeling spoiled for no choice? I'm quite thankful for the quiet, makes it much easier to keep up whilst at work! It'll pick up later when everyone returns home to these Narnia winter charts I'm sure! With this morning's 06z even Greece could be cold enough for a flurry or two At T+204. To be fair, they're most likely going on the latest EC46 dayer which does suggest low pressure close by around the 30 day period - Not a strong signal albeit but they've got to base the forecast on something and given that's what the models currently suggest, it's as good a guess as any. 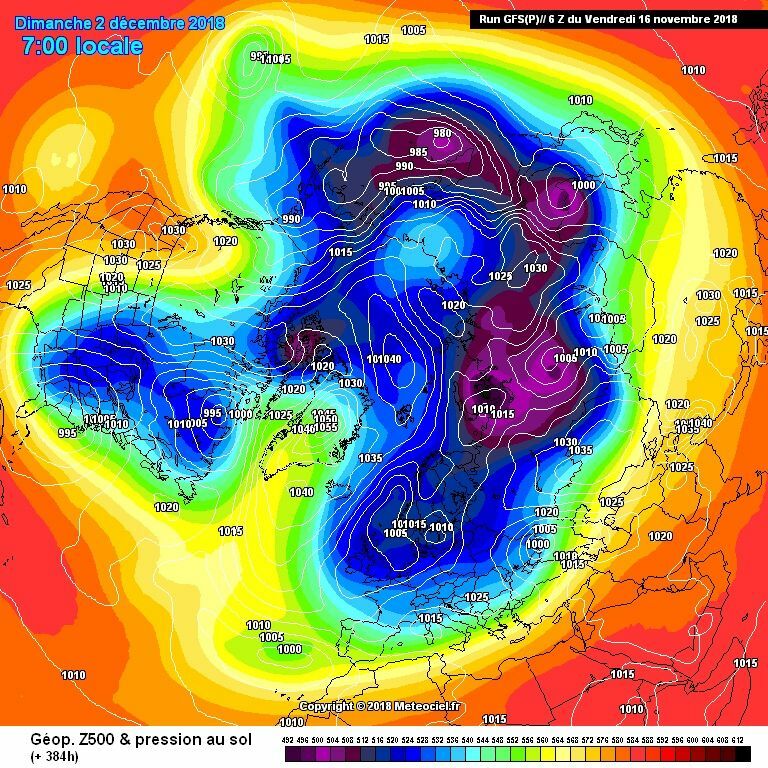 And to add to that METO update now suggesting cold dominating out to mid Dec with only a small chance of an Atlantic attack which will likely be short lived even if it does happen. Sounds very much like this huge blocking high is going to be the dominant player for quite a while!! I'm not so sure about that prognosis, Tim...a short-live milder interlude might also be suggestive of a disrupting front (or fronts) coming in from the west, and then slipping away southwards and leaving the cold block largely intact...? PS: I had to put my straw down, in order to type this reply! I think cold but dry is a safe bet, even with average 850’s under high pressure with continental influence it will feel bitter! 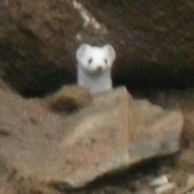 What people want is the white fluff, as of yet I’m not convinced that we will get what we want at this bite! Just my personal opinion but I think the model handling of blocking outside of reliable timeframe is questionable to say the least, they often seem over keen on cutting off the high when we normally end up with a saggier high as it gets towards a reliable timeframe, just as GFS low res often resorts to blowing up lows. Not convinced by either... On the fence, already got splinters in my bum! Exeter evidently happy to go with the block dominating for the forseeable- plenty of cold dry weather to come , as iv'e said, whats there not to like? Cold/foggy/frosty weather in December sounds sooooooo much better than Atlantic wind and rain!! Don’t no what all the moaning is about . The word blocked is how the weather is going to be for the foreseeable. There should be no complaints. Something very tasty is around the corner . 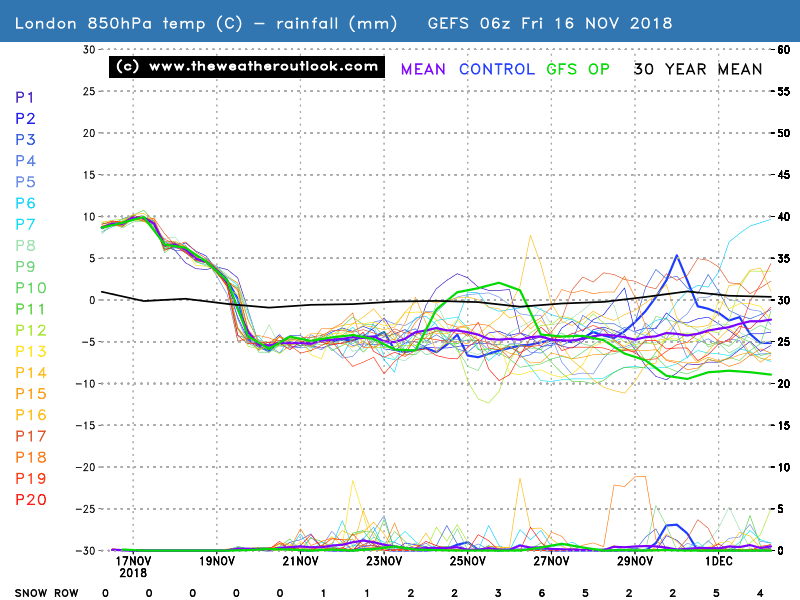 The GEFS ensembles are brilliant by the way . And the op was an outlier between the 24th and 27th . And the new GFS para was an amazing run . Time will tell if it’s the new top dog model . Yes, while the GFS seems hell bent on providing us with what most want to see i'm far from convinced and would suggest the block will sink somewhat but stay at a high enough latitude to deflect the Atlantic lows to our south and into Southern Europe, i can see this block meandering from the Scandy/iceland/northern UK and possibly back to where it started (scandy) if i were to take a stab.. The MO update does mention snow. Albeit mostly for higher ground. Continue to be bemused by people’s disappointment at the lack of snow prospects in the short term, given that there has never been any prospect of significant cold and snow next week. I haven’t seen a single model run or chart that has ever shown this. The general pattern is what is of interest, with it potentially being promising for significant cold and snow further into winter. I agree, Matt: so long as that block over Europe is maintained, the colder the continent will become...though we may not get the Beast we all want to see, should we do, it will likely be a stonker? Good post and I think the problem is people see the easterly and this has raised some undue expectations . 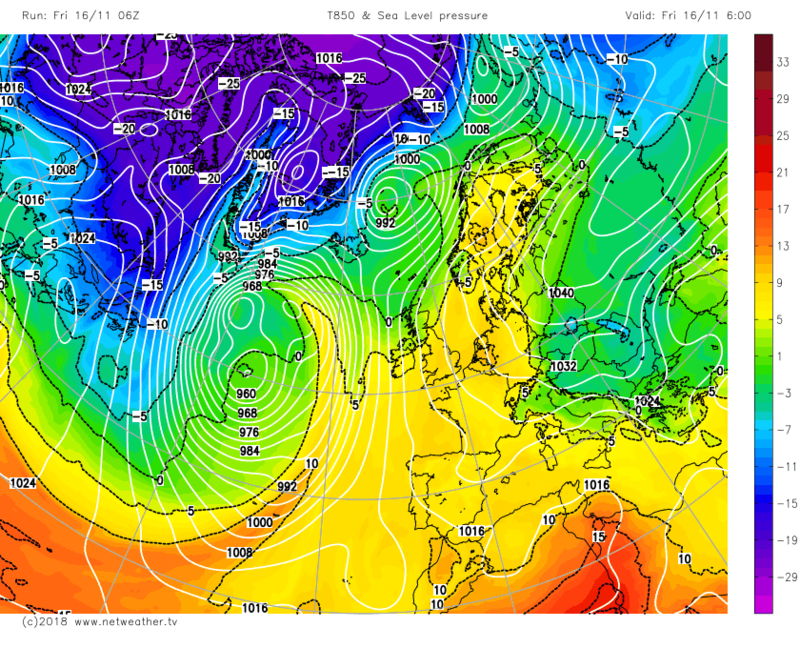 The easterly doesn’t have suitable cold uppers esp this early in the season. The main interest could be what happens afterwards . At the moment the models are playing around with the block and the exact trough set up to the east . There’s plenty of cold air there and it’s getting the right jet track to get that sufficiently west. The main thing is to get the block and then wait to see how things develop , plenty of time for changes . It is difficult to get deep cold this early in the season though. 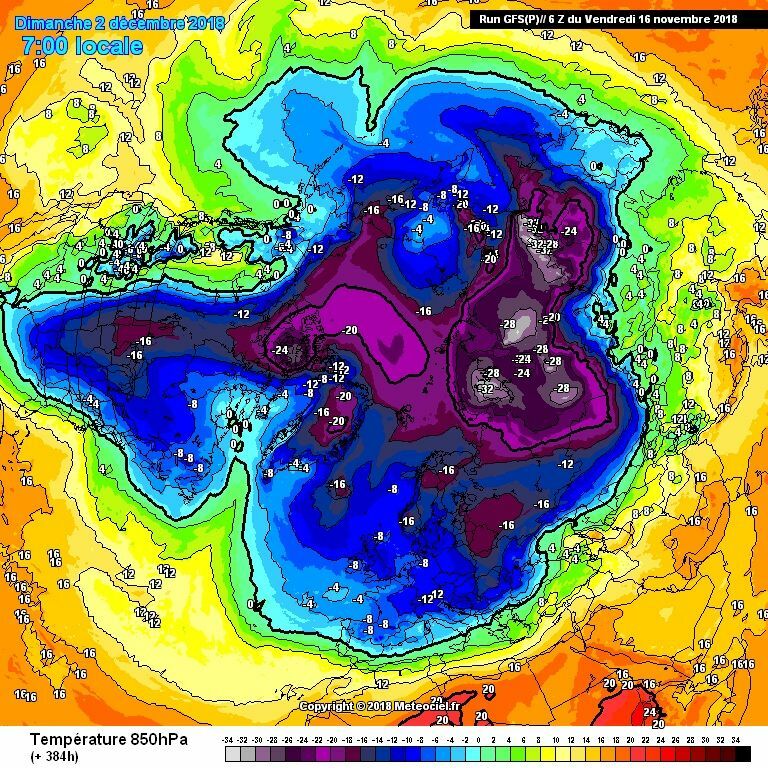 You need the flow to come from the north east rather than from the east, as per November 2010 (the only time I can remember seeing deep cold so early). The patterns being shown by some model output can deliver a north east flow further down the line, i.e. high pressure migrating from Scandinavia towards Greenland. Hence the building blocks we have in place and being shown are promising. Cooling down of the continent would also mean that any further easterlies would bring more significant cold to our shores. - The week after: A bit of a split but heavier clustering on the cold side, and, with many members maxing at 3C even in London, this time snowy cold is a greater possibility. This must be at least the millionth time myself or others in the team have requested this, so it would be great if those who keep ignoring these requests could take it on board. Can we keep it to the models in here please, discussion solely about meto updates and the like with zero context around the models is not for this thread. There is a met office thread in the general weather area for that.